Dushnikh Mine is an orichalcum mine that supports Dushnikh Yal. It is within the stronghold of Dushnikh Yal, to the south of Chief Burguk's Longhouse. * None of the miners ever seem to stop work for more than a few minutes or leave the mine even for sleep. There are numerous pickaxes and food sacks throughout the mine. Upon entering you are at the top of a ramp descending to the east, at the bottom is a cart containing five pieces of orichalcum ore, with several food barrels behind. 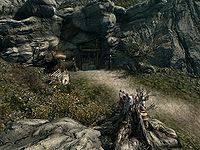 The path turns to the south, at the next junction there is a dead end to the east with a long wooden table and chair and an unlocked chest containing minor loot. On the table is a copy of The Code of Malacath, a portion of grilled leeks, a potion of minor healing, a piece of orichalcum ore and a random pair of gaunlets. To the west is another T-junction, with a rock pillar in front of you, on a rock behind it is a random stamina potion and war axe, to the north the path bears to the west with an orichalcum ore vein on the north wall and two potions of minor stamina--(see bugs) on a rock almost opposite, against the south wall. Further to the west are three more ore veins against the south wall and on the ground in front of it. Heading south from the T-junction the path descends before turning to the east and opening out into a large cave with a raised wooden platform against the rear wall in front of you, the ramp up to it is on your right. There are two ore veins on the east wall reached by climbing the platform. At the end of the platform is a long wooden table and bench, with two bottles of wine and a potion of minor healing on top the table. Under the platform against the east wall, on the ground is one final ore vein. In the northern corner of the lower area is a square wooden table with a loaf of bread and mead barrel on top and a pair of leather boots next to two unusable barrels beside it. 3 veins in the southernmost room (2 on the platform, 1 beneath). 1 vein in the passage to northern room. 3 veins in the northern room. 6 already-mined ore samples are located inside the mine, five are in a cart near the exit and one is on a table nearby. Gharol will buy orichalcum ore from you. The loose pieces of orichalcum ore are free to take if you are blood-kin to the Orcs. You may not be able to interact with the two potions of minor stamina found at the northern end of the mine. ?